Grant, we pray, O Lord, that, schooled through Lenten observance and nourished by your word, through holy restraint we may be devoted to you with all our heart and be ever united in prayer. Through our Lord Jesus Christ, your Son, who lives and reigns with you in the unity of the Holy Spirit, one God, for ever and ever. The clear will of God is the light and the salvation of all men. No one can desire anything good unless God desires it. Even the best of intentions, even seemingly worthy projects, are no good if they are not God's will at the moment. Distress, suffering, even death, can be accepted as His mysterious will. His creative love is always at work drawing the greatest possible good out of everything. Be the humble servant of God's will and you will be truly wise and always at peace. Today is the feast of Blessed Clemens August von Galen, Bishop of Münster (1933-1946). He remained there until 1894, when he transferred to the Antonianum in Vechta. After graduation, he studied philosophy and theology in Frebur, Innsbruck and Münster, and was ordained a priest on 28 May 1904 for the Diocese of Münster by Bishop Hermann Dingelstadt. His first two years as a priest were spent as vicar of the diocesan cathedral where he became chaplain to his uncle, Bishop Maximilian Gerion von Galen. From 1906 to 1929, Fr von Galen carried out much of his pastoral activity outside Münster: in 1906 he was made chaplain of the parish of St Matthias in Berlin-Schönberg; from 1911 to 1919 he was curate of a new parish in Berlin before becoming parish priest of the Basilica of St Matthias in Berlin-Schönberg, where he served for 10 years; here, he was particularly remembered for his special concern for the poor and outcasts. In 1929, Fr von Galen was called back to Münster when Bishop Johannes Poggenpohl asked him to serve as parish priest of the Church of St Lambert. In January 1933, Bishop Poggenpohl died, leaving the See vacant. After two candidates refused, on September 5, 1933 Fr Clemens was appointed Bishop of Münster by Pope Pius XI. On October 28, 1933 he was consecrated by Cardinal Joseph Schulte, Archbishop of Cologne; Bishop von Galen was the first diocesan Bishop to be consecrated under Hitler's regime. As his motto, he chose the formula of the rite of episcopal consecration: "Nec laudibus, nec timore" (Neither praise nor threats will distance me from God). Throughout the 20 years that Bishop von Galen was curate and parish priest in Berlin, he wrote on various political and social issues; in a pastoral letter dated 26 March 1934, he wrote very clearly and critically on the "neopaganism of the national socialist ideology". Due to his outspoken criticism, he was called to Rome by Pope Pius XI in 1937 together with the Bishop of Berlin, to confer with them on the situation in Germany and speak of the eventual publication of an Encyclical. On 14 March 1937 the Encyclical "Mit brennender Sorge" (To the Bishops of Germany: The place of the Catholic Church in the German Reich) was published. It was widely circulated by Bishop von Galen, notwithstanding Nazi opposition. The clarity and incisiveness of his words and the unshakable fidelity of Catholics in the Diocese of Münster embarrassed the Nazi regime, and on 10 October 1943 the Bishop's residence was bombed. Bishop von Galen was forced to take refuge in nearby Borromeo College. From 12 September 1944 on, he could no longer remain in the city of Münster, destroyed by the war; he left for the zone of Sendenhorst. In 1945, Vatican Radio announced that Pope Pius XII was to hold a Consistory and that the Bishop of Münster was also to be present. After a long and difficult journey, due to the war and other impediments, Bishop von Galen finally arrived in the "Eternal City." 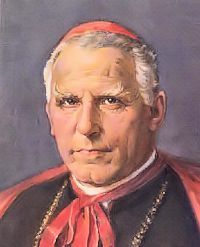 On 21 February 1946 the Public Consistory was held in St Peter's Basilica and Bishop von Galen was created a Cardinal. Read this sermon by Bl. Clemens August Count von Galen. From Catholic Culture's Library read these inspiring articles on the life of Bl. Clemens August Count von Galen: Faith and Fatherland, One Fearless Voice: The Lion of Munster; The Bishop vs. the Nazis: Bl. Clemens von Galen in World War II Germany.